In recent years, there has been a perception that Eat Bulaga, a Philippine noontime variety show, is for a more mature crowd. It’s the moms, dads, uncles, aunts and grandparents at home that still loyally watch them. Eat Bulaga’s rival, It’s Showtime, is reputed to more popular to the younger, more social media savvy crowd. 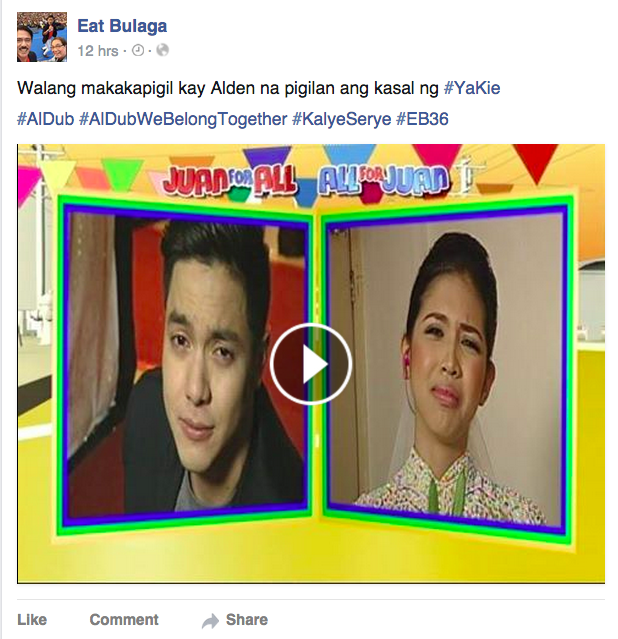 Fast Forward to 2015, Eat Bulaga connected big with the younger market through #AlDub. If there was a Philippine version of “breaking the internet”, the Aldub phenomenon did it on August 8. If you want to see the August 8 episode that the netizens went crazy about, go the Eat Bulaga Facebook page here. How did Eat Bulaga find success with younger audiences? Here’s how the show got things right. Eat Bulaga has been around for 36 years and its viewers has aged with it. The show must find ways to appeal to younger audiences. In this day and age, TV shows have their work cut for them in that regard. The payoff is great though. Young people (below 30) are voracious consumers of media and technology. They also spend a lot of time on social media sites, and they share a lot of what they think and feel. Success with these audiences, may mean great engagement for Eat Bulaga, and eventually for the brands that advertise in the show. 1. It gets young people for the show. Sometimes it is as simple as getting people that your target audience can relate to. The younger hosts are not just wallflowers. They get their own spot in the limelight. Alden Richards – the Al in AlDub (his official Facebook page here), a 23 year old actor, was a great recent “get”. Eat Bulaga spiced up his career, and he’s paying back the favor by helping the show connect with the youth. Win-win situation here. 2. It embraces the Dubsmash phenomenon. Dubsmash, the popular lipsynch app, skews very young. Eat Bulaga not only incorporates Dubsmash segments into its show, it brought in as a co-host Maine Mendoza (official twitter account here), nicknamed the Philippines’ Dubsmash queen. Her character, named “Yaya Dub” (in the show, she never speaks, she dubs all the time of course) is half of what will eventually become #AlDub. Pick one of Maine’s dubsmash compilation videos here. Dubsmash is not only big in the Philippines. It’s big all over the world. 3. It latches on virality. When stuff and people go viral, there is something inexplicable that draw audiences to them. Eat Bulaga skips the part of figuring out the “why” and just spoofs the viral stuff in the show, It goes even further by making the young people that went viral part of the cast. Yaya Dub Dubsmash compilation that went viral was her ticket to a hosting gig in Eat Bulaga. The show also has another popular segment “That’s My Bae” that features good looking young men that recently went viral. Another plus? These people already have a sizeable following, there’s little to do to build them up. 4. It knows that spontaneity is key. Young audiences do not like to be manipulated. That is why those pre-planned “viral” marketing pushes never really work. The young ones are attracted to spontaneous phenomena. The Eat Bulaga portion “Problem Solving” where Yaya Dub is seen, is a segment of impromptus. The Aldub phenomenon is actually a result of an improptu (read how it all started here). On August 8, when the show “broke the internet”, the mother of all sponatenous events happened. Yaya Dub fainted for real (from fatigue, according to reports) and was rushed to the hospital in what was supposed to be a key twist. The rest of the cast had to adlib their way to the end. 5. It backs up hype with talent. Viral internet stuff usually have amateurs behind them. People may lose interest in them quickly. Eat Bulaga backs up these newbies with its roster of talented and seasoned comedians to keep things entertaining and interesting. The show backs up the hype of new media with the resources and stability of traditional media. 6. The show “trends” smartly. Many “trending” hashtags are empty ones, those that proponents insert randomly in posts with unrelated content. Eat Bulaga doesn’t trend for the sake of trending, the content is truly something of interest for its viewers. 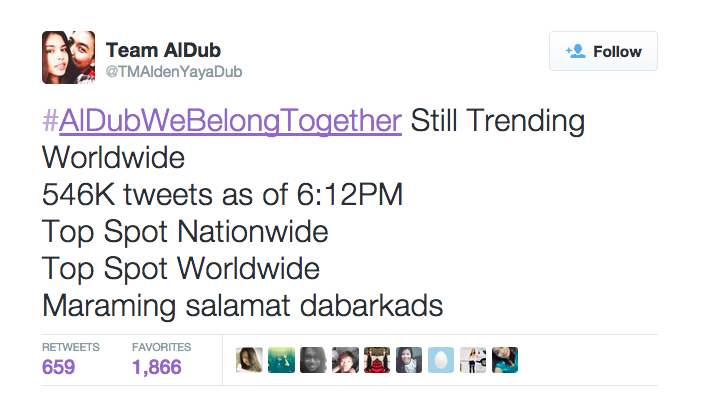 On August 8, the Aldub phenomenon became a worldwide trending topic for quite some time. The hashtag #AlDubWeBelongTogether amassed more than half a million tweets on what was supposed to be the #YaKie wedding day. Those hashtags and others such as #AlDub (Instagram link here), #Kalyeserye (Instagram link here) and #TamangPanahon (twitter link here) are still generating a lot of Facebook, Twitter and Instgram mentions until the following day. 7. Eat Bulaga simply knows how to reinvent itself. If a show remains popular for many decades, the people behind them know how to keep things fresh. Critics say that the Aldub hype will eventually die down. I agree — but a show that has been on for 36 years and counting, never really depends on hype anyway. If you run a business, such as Eat Bulaga, which wants (or needs) to make an impact on younger audiences. Here’s a good read about creating a social media strategy for your business. While Eat Bulaga connects with the youth, it doesn’t need to worry about its older audiences. They are still… or rather, we are still here for the show. We love it more than ever. All I need now is my own Dubsmash vid to prove it. Are you an Aldub fan too? Previous Previous post: A Blog Post to Gold’s Gym Philippines: “Thanks” for Kicking Us Members Out! Next Next post: @Senyora and Her Ilk – Are Parody Social Media Accounts the New Tastemakers?